I was in Santa Monica two years ago when Bulger was captured. I attended his trial in Boston this past August and his sentencing last month. I hope the accounts of my meetings with Whitey’s brother Jackie as well as Whitey’s lawyers, witnesses and TV personalities which I sent back have been enjoyable to read. For those of you visiting over the holidays, past editions of the Wednesday paper that have my column are available at the offices of the Examiner-Enterprise or you can visit my website www.originalbuffalodale.com With that said it’s on to my Christmas story of true crime. After Whitey’s sentencing I visited with Massachusetts State Police Lt. Steve Johnson and his remarks revealed a great deal about the twenty years it took to bring down south Boston’s most notorious crime boss. It was Steve and special DEA AgentDaniel Doughtery who were credited with persisting in the pursuit of the man who has just been convicted of killing eleven people and participating in the murders of seven more. It was Steve and Daniel who opened up the first grave that held six bodies and later it was these two dedicated cops who found the bodies of Tommy King and Debbie Davis in a marsh. You couldn’t make up the stories these two had to tell. As Whitey’s accomplices started making plea agreements, they began drawing maps leading to other bodies and telling the cops stories about the murders that were so gruesome they affected them personally. The death of Debbie Davis was one such story. The Davis family endured more tragedy than most during the Bulger era and hearing how the seventeen year old Debbie got involved with the gang and met her death at such a young age had bothered both of them. The description of the location was quite vague and the area was roughly half the size of a football field. A backhoe had been digging for days and the two cops dissected every scoop of dirt it brought up. It was on the last day of digging and literally with the last scoop of earth when the corpse was finally discovered. Debbie has been the girlfriend of Whitey’s hit man Stephen Flemmi . When Flemmi tired of her he decided she knew too much about his activities then lured her to a house where Whitey was waiting to strangle her. The pair stripped her, wrapped her body in plastic and duck tape, threw it in the trunk of a car and left it there for hours while they decided where to bury her. Now with the discovery of her remains, Debbie could finally be put to rest. At times the brutality of the things they learned about was almost too much for the two cops but in the end they felt it was all worth it when they got their man. Debbie’s brother Steve Davis and I have spoken often about his efforts to get justice for his sister and he also praises the work of Lt. Johnson and Agent Dougherty. Steve lost two sisters and a brother to the Winter Hill gang and his life has been threatened too. Steve was at the trial everyday and frequently voiced his hatred of Whitey and anyone associated with him. The eight week trial had taken a toll on everyone by the end of August when the jury found James Whitey Bulger guilty of murder and of operating a large criminal enterprise. The enterprise lasted from the late 1960s through the 1990s and encompassed drugs, extortion, book making, money laundering and racketeering. Whitey was also found guilty of corrupting FBI agents and a couple dozen other cops who were also on his payroll. These activities had made Whitey a very wealthy man and his favorite saying at this time of year was “Christmas is for cops and kids.” Now the question is where was all the money? When he was captured in Santa Monica, the cops found over $822,000 dollars along with some high priced jewelry and a bunch of guns. In Boston his brother Jackie recently lost his $60,000 a year pension when a safely deposit full of cash was discovered. It’s clear that Whitey will never see any of it but what about the others? Stay tuned for the second part of this article to learn more. Welcome back. When I’m traveling I get the chance to get caught up on my reading material so with the new Land Report just out, this week I thought I’d give you this year’s report on the largest landowners in America. Taking the number one spot again this year with two million two hundred thousand acres is John Malone. A man who loves his land, Malone bought several new tracts of property in the past year including Homewood Castle just outside of Dublin, Ireland. According to the Irish Times, he paid 9.5 million for the 38,000 s.f. structure which was built in 1867 and sits on 427 acres. In the U.S. Malone also purchased a 7.8 million dollar home in California along with a 123 acre horse farm just a stones throw away for 12.5 million. Ted Turner is number two again with 2 million acres. Although Turner didn’t buy any big new parcels of land during the past year, he did buy the Sierra Grande Lodge and Spa in Truth or Consequences, New Mexico. Here in Oklahoma two families made the list again. According to the Land Report the Drummond family in Osage county is 17th with four hundred and thirty-three thousand acres and out of Yukon, Bob Funk is 59th with one hundred and seventy-five thousand acres. As many know, the Drummond empire began over a century ago when Cecil Gentner and A.A. Drummond partnered up and of course nowadays the family has added Bartlesville native Ree Drummond (aka “The Pioneer Woman”} to the clan. Now from large ranches to large elk. Here in Oklahoma there are several herds of these beautiful animals including one just outside Bartlesville at Woolaroc. This group is often seen close to the road and with thirty-five cows and fourteen bulls, each weighing around six hundred pounds, their presence is nothing less than majestic. It is worth the trip to hear high pitched bugle of the bulls and with the Christmas lights up and going for just one more weekend, now is the perfect time to visit. Calves are typically born in late May or June with camouflage coloring to protect them from predators. Bulls shed and grow a new pair of antlers each year and the antlers can weigh up to 40 pounds. Cows and calves live in groups but the bulls live in bachelor groups or alone. Elks’ noises and physical posture can tell you what the animals are thinking. When their heads are held high with wide open eyes and rotating ears, the elk are alarmed. Laid back ears with flared nostrils, while stomping the ground with front feet, usually signals agitation. Elk breed in the fall and guard their harems from other bulls, often leading to violent battles which occasionally result in death. This is one reason why you are warned to remain in your car when you are observing elk up close. Another herd in Oklahoma lives on the J.T. Nickel Preserve outside of Tahlequah. Although this herd has been as large as 72 animals, they are free roaming so it can be hard to spot them but it is a beautiful preserve and well worth the drive. If you are traveling in New Mexico you may get the opportunity to see Rocky Mountain elk which tend to be a bit larger. These are called “Roosevelt’s Elk” and the bulls which can be as large as 900 pounds are sought after by hunters who pay upwards to twelve thousand dollars for these trophies. I’ve seen them on Bob Funk’s UUBar Ranch in a place like no other called “Valley of the Giants” and my friend if you ever see one they look more like some kind of dinosaur. Albino bear also live on the UUBar and sitings of Sasquatch or Big Foot as they’re commonly called have also been reported. 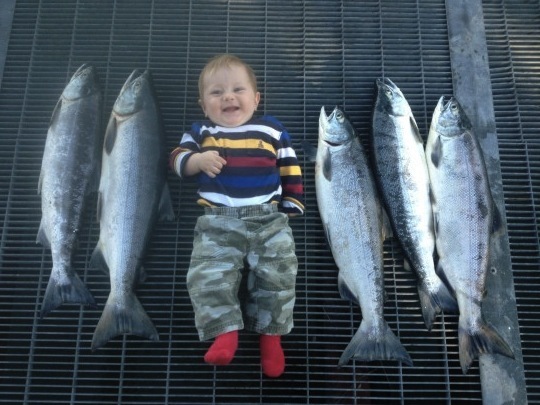 Calan Ashton, picture taken in late July on the Kenai River in Alaska. These are “Reds”, red salmon. He was the best catch of the day! Welcome back. If you’ve kept up with the trial of Boston gangster Whitey Bulger on the internet, TV, radio and in print you know his history of racketeering, money laundering, murder and more. Whitey sat silent all during the trial but his lawyers Jay Carney and Hank Brennan tell me he really wants to talk! Although Jay will no longer represent Whitey, Hank will stay on and has recently filed an appeal. I also visited with Whitey’s brother Jackie Bulger a couple of times during the proceedings about his brother’s health. Jackie has been seeing him every week at the Plymouth County jail and he says Whitey is doing well for an eighty-four year old and is anxious to tell his side of the story about the FBI and how it all worked. Outside the courthouse and in front of dozens of reporters, David Wheeler stated that the crooked cops were just as bad (or worse) as Whitey and unless I’m seeing things this story is not over yet. Jackie has my address and I’ll keep you up to speed on events. After the sentencing business took me to Greenwich, CT and eight days of getting up every morning at 4:15 to catch the 5:22 Metro North train to New York City. Greenwich is the former home of Kennedy cousin Michael Skakel who was convicted of murdering Martha Moxley. Although the crime occurred when both Skakel and Moxley were fifteen years old, Skakel was only convicted eleven years ago at the age of forty-two. Just coincidentally, he was released on bail pending a new trial while I was there and the press was thick all over town. As for me, I was headed for a visit with Matt Lauer and I had the opportunity to speak with him on two occasions about another murder I thought he might be interested in. On my third visit the ever jolly Al Roker and Samantha Guthrie got involved and I’ve got to tell you they are as friendly in person as they appear on TV. Dale shakes hands with Savannah Guthrie of The Today Show. Here’s today’s tip: If you’re going to the show and want a good breakfast close by, eat where many of the Today Show staff do, across the street at “28 Scots”. My adventures also took me to Times Square and the filming of the David Letterman Show. Although I was there for a reason, the show is free to attend and is quite fun. Another fun thing to do that won’t cost you is the Staten Island ferry ride which provides regular service to and from Manhattan, giving riders an up close look at the Statue of Liberty and Ellis Island. With a small snack bar on board and views of the city like no other I’d gladly pay. The American Indian Museum is in the same neighborhood and admittance is free there as well. If you are new to the city I would recommend the hop on/ hop off Grey Line double-decker bus tours which feature a guide who points out all the historic sites, the apartments of famous people and many other fun facts along the route. Sights such as Grant’s Tomb, the Dakota apartment building, Yankee Stadium and the Empire State building make this a must. The loop through Central Park is one of my favorites and at $59 for a 2 day pass you can’t beat it. Another form of transportation I enjoy is the subway. With clean cars and maps that clearly show the routes, the subway will take you anywhere in the city much more cheaply than a cab and with far less hassle than driving a car. Before I go I want to make one more note about the Metro North train I rode back and forth which is the cost. The fare was $12 round trip from Greenwich, CT to Grand Central Station in New York and back. Motels are also much cheaper outside of Manhattan where rooms run anywhere from $400 a night and up. The trains are clean and safe and every car has a restroom which is important because clean ones can be hard to find at times. As I’ve said before, I highly recommend a visit to NYC and with a little planning it can be very affordable. I always find the local people there mostly friendly and willing to help an old scout, tracker, translator and interpreter. Coming up, with all the reports of great snow out west, I’ll be bringing you a report on the opening of ski season at Angel Fire and Red River New Mexico. Till next time, if I’m not sleeping with the fishes, I’ll see ya down the road…..